The side-by-side images feature individual mouse cells in grayscale microscopy and those same cells rendered in a pastel, color-by-numbers image that illustrates skin stem cells' self-renewal process. Greco and teammates Kai Mesa, Ph.D., and Katie Cockburn, Ph.D., in collaboration with Kyogo Kawaguchi, Ph.D., and Allon Klein, Ph.D., from Harvard, shattered dogma, which held that skin stem cells decide when to renew themselves. Instead, they found that neighboring epidermal cells create a niche environment that drives the timing of stem cell regeneration. Greco's personal journey toward making these discoveries was filled with twists and turns, punctuated by one transformative moment as she considered pursuing her doctorate in the late 1990s. 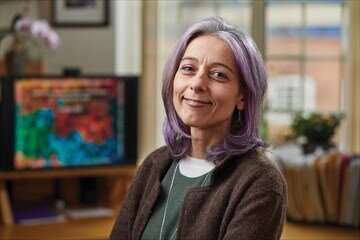 After earning an undergraduate degree in molecular biology at the University of Palermo in her native Italy, Greco stayed on for two years as an unpaid researcher, a typical practice at the time, in a lab with meager resources. The bleak research environment was all Greco knew and it felt normal to her, until—fortuitously—her alma mater turned down her doctoral application. That rejection became her catalyst to look elsewhere. She landed at the European Molecular Biology Laboratory (EMBL) in Heidelberg, Germany, which felt a world away. "When I interviewed there, I saw that science was a world of fun," Greco says. "It was essentially the difference between having resources that allow you to really move your ideas forward, as opposed to having to be creative, but for survival." After studying principles of tissue growth under Suzanne Eaton, Ph.D., at EMBL, a supportive and "powerful" experience that she cherishes, she took a postdoctoral fellowship in the lab of Elaine Fuchs, Ph.D., at the Rockefeller University. That is where she first delved into epidermal stem cells and the epithelium itself, which have been her focus since she arrived at Yale in 2009. The Greco lab has observed that, aside from their interplay with stem cells, epidermal cells in mice perform roles usually left to the immune system, such as the clearing of dead cells and correction of tissue defects including tumor-like growths. "We are fascinated by the idea that the epithelium can take care of many housekeeping functions in the skin," Greco says. In particular, she suggests, a better understanding of how epidermal cells address microinjuries or mutations may lead to new ways of approaching cancer treatment. Greco also finds it important to contemplate the environment of her own laboratory, to ensure that her team members can thrive. "I am continuously scrutinizing myself and our lab to be as free from codes that society gives for determining talent," Greco says. "We make a special effort to think carefully about the biases we hold that affect the way we hear and respond to ideas from others." This philosophy, in turn, "creates a space where these people can conceptualize the best idea ever, and shape it in a way that, as they approach science within my lab, they are independent." She credits her dedication to younger colleagues' success to that of her own mentor at Yale, the late Carolyn W. Slayman, Ph.D., deputy dean for academic and scientific affairs, Sterling Professor of Genetics, and professor of cellular and molecular biology. Greco says Slayman set a standard for developing opportunities for junior faculty. "The fact that I carry her endowed professorship is particularly touching to me." Greco says she wants her mentees to feel deep respect, so they can share any idea, no matter how unusual it might seem, through conversations that are often difficult, but necessary. "That's how you create an environment for learning and creative thinking and pushing forward, rather than something that needs to fit a very narrow filter." Her desire for a positive environment also extends to women throughout the medical school. Greco is deeply involved with the Committee on the Status of Women in Medicine (SWIM), which has worked to provide a more favorable balance of power and of opportunity for women faculty since 1979. Says Greco, mindful of her own growth since her postdoc years: "If you give people a voice and empower them and invest in individual quality, then people could do so much better and the organization that they are part of will have more impactful outcomes." Any thoughts as to age or liver spots as a result of a fungal infective that disables cell turnover and thus contributes to a cancerous growth?